For the photogenic and geologic formations, in the range's north, see Chiricahua National Monument. The Chiricahua Mountains massif is a large mountain range in southeastern Arizona which is part of the Basin and Range province of the west and southwest USA and northwest Mexico; the range is part of the Coronado National Forest. The highest point, Chiricahua Peak, rises 9,759 feet (2,975 m) above sea level, approximately 6,000 feet (1,800 m) above the surrounding valleys. 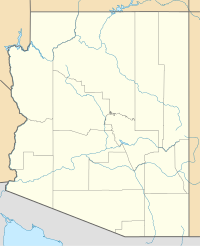 The Chiricahua Mountains, and other associated ranges, along with Sulphur Springs Valley on the west and the San Simon Valley on the east, form the eastern half of Cochise County in southeast Arizona. The Pedregosa Mountains are found at the southern end of the Chiricahua Mountains, while the Swisshelm Mountains are located to the southwest. The northwest end of the Chiricahua mountains continue as the Dos Cabezas Mountains beyond Apache Pass and the Fort Bowie National Historic Site. Access to the Chiricahua Mountains and Coronado National Forest is through Willcox from the north, Douglas from the south, and Rodeo from the east. The earliest evidence of humans in the vicinity of the Chiricahua Mountains are Clovis archeological sites such as Double Adobe Site in the Whitewater Draw tributary of Rucker Creek north of Douglas. Subsequently, the Cochise culture another pre-ceramic based culture spanning 3000 - 200 BCE was defined from sites around the Chiricahua Mountains, including Cave Creek Canyon. Following the transition to ceramics, artifacts characteristic of both Mogollon culture and its local variants, the Mimbres culture, are found. These relics span the period from 150 BCE - 1450. The influx of other indigenous peoples, such as the Chiricahua Apaches, including the leaders Cochise and Geronimo occupied the area until forced removal in the late 19th century. The name Chiricahua is believed to originate from the Opata name for the mountains, Chiwi Kawi, meaning "Turkey Mountain". The Chiricahuas were once known for an abundance of wild turkeys. The first recorded mining claim in the Chiricahua Mountains was the Hidden Treasure claim filed in 1881, and mining has continued intermittently to the present with the greatest periods of activity occurring in the 1920s and 1950s. More recently, the Chiricahuas have fallen into use by people smugglers and drug cartels, who position lookouts on their peaks to warn of Border Patrol activities. The Chiricahua Mountains are an uplifted structural block of the Basin and Range. The mountains contain Precambrian basement rocks, Paleozoic and Cretaceous sedimentary rocks around a caldera complex formed by volcanic eruptions and intrusions 35 - 25 million years ago. The last major eruption, 27 million years ago, created the Turkey Creek Caldera and laid down 2,000 feet (610 m) of volcanic ash which fused into welded rhyolite tuff. Subsequent erosion has created mountain ridges covered in stone spires and stone columns, hoodoos, that rise up out of the forest. These natural features, preserved in the Chiricahua National Monument, are composed of Rhyolite Canyon Tuff. A one to two mile wide band of sedimentary rock running southeast to northwest from south of Portal through Paradise and up to the Dos Cabezas Mountains is the source of mineralized deposits. The largest of the mines developed in the California district of the Chiricahua Mountains was the Hilltop mine which consisted of 3 interconnected levels totaling 6,098 metres (20,007 ft). The Chiricahua Mountains are a bio-diverse area which is composed of numerous sky islands. Five of the 9 life zones are found in the Chiricahua Mountains. Three hundred and seventy-five avian species have been recorded from the Chiricahua Mountains; some are largely Mexican species for which southern Arizona is the northern limits of their ranges. Other animals of note include ocelots, jaguars, mountain lions, nine-banded armadillo, black bears, and white-tailed deer. With the base of the Chiricahuas at about 3,600 feet (1,100 m), the range covers about 6,000 feet (1,800 m) in elevation. Grasslands and desert cover the base of the range, with ponderosa pine and Douglas fir at the highest elevations. Cave Creek Canyon on the east side is home to the American Museum of Natural History Southwest Research Station and the small towns of Portal and Paradise. 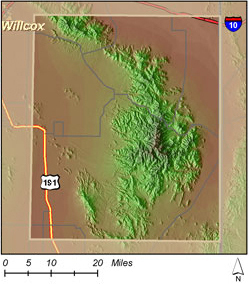 Chiricahua Mountain Range (massif), and its sub-Ranges, with the bordering valleys. ^ "Arizona Memory Project : Compound Object Viewer". azmemory.lib.az.us. Retrieved September 5, 2010. ^ Nathan Thornburgh (14 June 2011). "Border Crackdowns and the Battle for Arizona". Time Magazine. ^ Leo W. Banks (30 June 2011). "Arizona Burning". Tucson Weekly. Archived from the original on 3 July 2011. 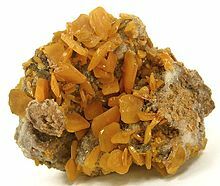 ^ "CVO Website - Arizona Volcanoes and Volcanics". vulcan.wr.usgs.gov. Retrieved September 3, 2010. ^ "Hilltop Mine (Hand Mine; Kasper tunnel; Gray Mine; Dunn shaft; Blacksmith shaft; Rhem adit), Rustler Park, California District, Chiricahua Mts, Cochise Co., Arizona, USA". mindat.org. Retrieved September 5, 2010. ^ Scroch, Matt. "Sky Islands of North America: A globally unique and threatened inland archipelago". Terrain. ^ "Natural Vegetation of". southwest.library.arizona.edu. Retrieved September 3, 2010. ^ "Audubon: Birds & Science [-109.28, 31.9057] - Chiricahua Mountains, Coronado National Forest". iba.audubon.org. Retrieved September 3, 2010. The Nature Explorers Chiricahua Expedition A 2-hour 49 minute ecosystem video. "Chiricahua National Monument". National Park Service.